Firstly, there are numerous different types of masks out there for you to choose from. One thing to remember is this, just because it is expensive doesn’t make it a good mask. You want your mask to fit comfortably and snugly. To find the mask that fits you, grab a few different masks and hold them up against your face (as if you had it on), but with the strap dangling off the back. Don’t actually pull the strap over your head. Now take a breath in through your nose, at this point you should feel the mask squeeze against you. Now let go of the mask and lean over, looking down at the floor. If the mask doesn’t fall off, you have found one for you. If it falls off or loses pressure then once in the water this mask will leak. Completely ruining your dive. Diving masks may have a single, durable, tempered glass plate in front of the eyes and a “skirt” of rubber or silicone to create a watertight seal with the diver’s face. Some masks may have two lenses, which in some cases allow the user to fit prescription lenses. 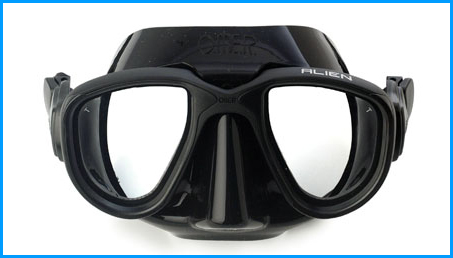 In the case of freediving/spearfishing masks, which need to be low volume to minimise the change of pressure that occurs with depth, the lenses may be made of polycarbonate plastic. All masks have an elastic strap to keep them in position. Masks that are used at depth must be constructed so that the diver can exhale through the nose into the mask to prevent the “squeeze” caused by increasing pressure during descent in water. The nose section of the mask also needs to be flexible to allow the diver to perform an equalisation manoeuvre such as the valsalva manoeuvre or the frenzel manoeuvre when equalising pressure in the middle ear. To prevent a mask from fogging up due to condensation on the glass plate many divers spit into the mask, wipe the spit around the inside of the plate and wash it out with a little water. There are commercial products that can be used as an alternative to the saliva method. Mask should always be rinsed inside and out with clean, fresh water after each day’s use, and dried off after washing. A mask should not be stored in direct sunlight for long periods of time as ultraviolet light degrades the silicone. A well-maintained mask will last for many years. A swimmer’s snorkel is a tube typically about 30 centimeters long and with an inside diameter of between 1.5 and 2.5 centimeters, usually L- or J-shaped and fitted with amouthpiece at the lower end, and constructed of rubber or plastic. It is used for breathing air from above the water surface when the wearer’s mouth and nose are submerged. The snorkel usually has a piece of rubber that attaches the snorkel to the outside of the strap of the diving mask. An older technique is pushing the snorkel between the mask-strap and the head, but this practice increases the chances the mask will leak. The most common type of snorkel is a simple tube that is allowed to flood when underwater. The snorkeler expels water from the snorkel either with a sharp exhalation on return to the surface (blast clearing) or by tilting the head back shortly before reaching the surface and exhaling until reaching or “breaking” the surface (displacement method) and facing forward again before inhaling the next breath. The displacement method expels water by displacing its presence in the snorkel with air; it is a more advanced technique that takes practice but clears the snorkel with much greater efficiency.